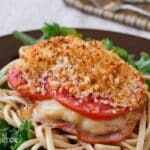 This chicken cordon bleu recipe stacks the ingredients over the chicken instead of stuffing them inside. And it’s baked, so it’s a simpler and healthier version of the classic. 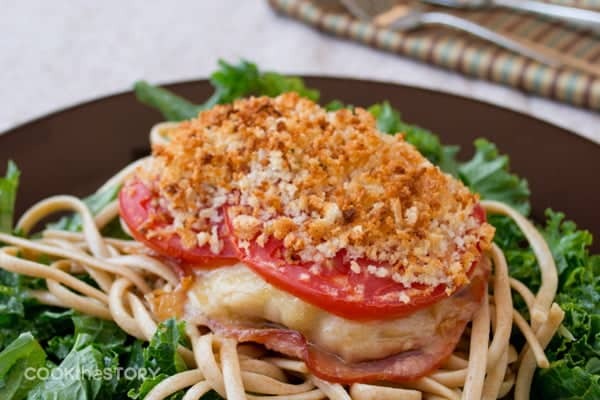 Chicken Cordon Bleu is a classic, usually made by stuffing ham and cheese inside of a chicken breast. 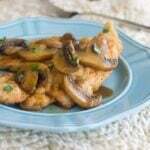 When it comes to weeknight meals, I didn’t want to spend the time stuffing. 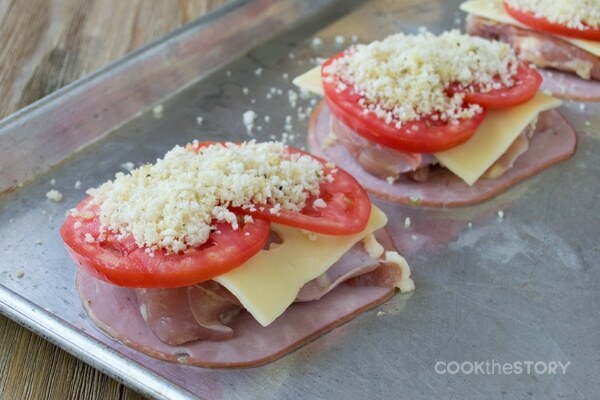 Instead, I came up with this Chicken Cordon Bleu recipe where the ham, chicken and cheese are simply layered. Notice that the ham’s on the bottom? That’s to catch any cheese that melts off the top and tries to slide away. Some of the cheese does make it off of the ham. That cheese gets all brown and crunchy and amazing. See? If you’re a lover of chicken cordon bleu, be sure to also check out my recipe for chicken cordon bleu lasagna rolls. 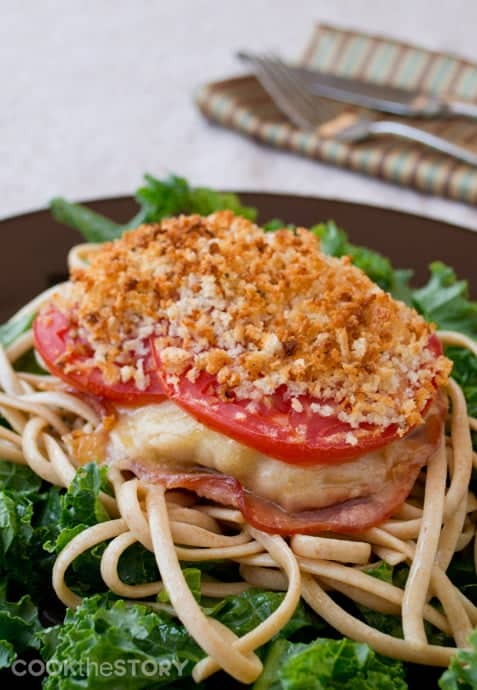 This is an easy weeknight version of Chicken Cordon Bleu. Instead of stuffing the chicken pieces, you lay everything on top of the chicken, which really saves time. Preheat the oven to 400º F. Rub a medium-sized baking sheet with 1 teaspoon of the olive oil. In a medium sized bowl combine the bread crumbs, salt, pepper, garlic powder and the remaining teaspoon of olive oil. Set aside. Lay the 4 slices of ham out on the baking sheet in a non-overlapping layer. 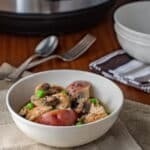 Take a chicken thigh and unroll it so that it is a flat single-layered piece. Put it on top of one of the slices of ham. Repeat with the remaining chicken thighs. Top each chicken thigh with a slice of cheese. 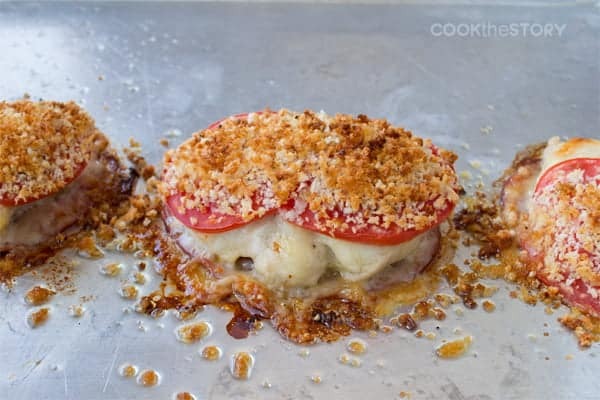 Overlap tomato slices over each piece of cheese and then top each set of tomatoes with one quarter of the bread crumb mixture. Bake until chicken is cooked through and bread crumbs are browned, about 20 minutes. (This post originally contained a story about my husband and his amazing cooking skills. I’ve removed the story). This is really good!. 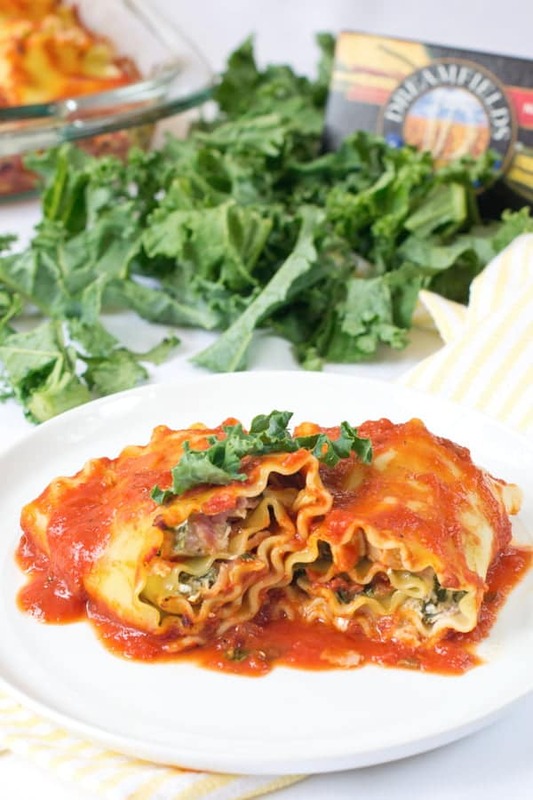 The recipe is quick and simple, and the results are delicious – thanks so much! Thanks, Kirk. So glad you liked it!! Ok, I want this right now. DH knows how to make crepes and really good coffee. Nice BUT this would be even better. Crepes, you say? I don’t think my man can do that. He does make a mean coffee though. I honestly am just happy whenenver he cooks. Doesn’t matter what he makes, I always think it’s amazing. And so nice to sit at the counter, sip wine and watch. Well, I divorced the man who was sharing my kitchen, but a lifetime ago I said I would marry him after he made me a raspberry souffle! Still love a raspberry souffle AND a man who knows his way around the kitchen! Great story Christine. I think it is FAB that your man wants to keep his recipe a secret. I am just thrilled you are willing to share yours! Betsy, I totally understand the pull of the raspberry souffle. Or any kind of souffle. That is one dish that I have not come anywhere near perfecting yet. Always a disaster, actually. Maybe I should get my man to give it a try! It’s been ages since I’ve had Chicken Cordon Bleu. Seeing this makes me want it very soon. I love your version that isn’t breaded and fried. Thanks Renee. I rarely fry anything. So rarely that I hadn’t even realized that it was remarkable here. But you’re right. 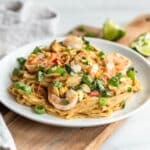 This is not only easier but healthier than the original. Love the short-cut of everything on top! I’m pretty happy whenever my hubby decides to grill…but, he did make me a tasty carrot cake from scratch once!